Tucson, Ariz. — FSL is holding a grand opening for the new Marist on Cathedral Square on Thursday, April 11 at 10 a.m. 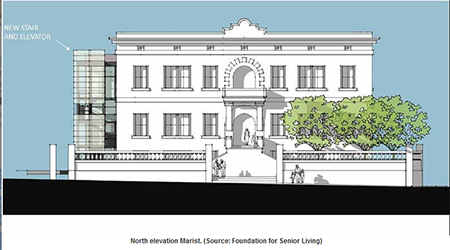 The new affordable senior living apartments are located at 111 S. and 235 S. Church Ave. in Tucson. Tucson Mayor Jonathan Rothschild, Pima County Board of Supervisors Chairman Richard, Elías, Carol Ditmore, director of the Arizona Department of Housing, Marietta Nunez, VP, Community Investment Officer for the Federal Home Loan Bank of San Francisco, and two county housing commissioners will be in attendance. 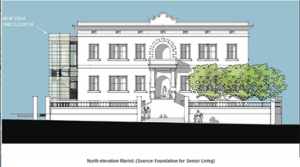 The $25 million project turned the historic Marist College into the site of a new affordable senior living community featuring 83 units. The project was funded by Low Income Housing Tax Credits (LIHTC), FHLB of San Francisco Affordable Housing Program (AHP), Rio Nuevo Tax Increment Finance and Pima County G.O. Bonds. The property features spacious one and two bedroom units between 630 and 875 square foot. All utilities except cable and phone are included in rent. Residents will enjoy free amenities like an intercom system, security system, laundry facilities, a computer center, a spacious community room with a full kitchen, fitness room, and community space on the roof top. Residents can also participate in free activities like a financial literacy classes, computer training, health promotion and disease prevention, wellness classes, blood pressure/health screenings and a food pantry. It’s a smoke free property and the Marist does have some resident parking on site. The trolley and public transportation are conveniently located right next to the property. FSL is a 501(c)(3) organization whose mission is to provide home and community-based services and to develop energy-efficient, affordable housing to promote health, independence and dignity for all. With a long history of helping Arizona families with issues including health, hunger, aging, illness, loneliness and substandard housing, FSL is committed to improving the quality of life for all Arizonans. To learn more about FSL programs and services, visit fsl.org. Next articleCBRE Secures $25.5 Million in Financing for Multifamily Property in Mesa, Ariz.